The Maryland motto, Fatti Maschii Parole Femine, has not specifically been adopted as a state motto. Rather, it has been accepted as a state motto because it was adopted as an element of the Great Seal of Maryland. The motto dates back to the Great Seal of the Province of Maryland, which included the arms of the Lords Baltimore (Calvert family). Fatti Maschii Parole Femine appeared on this seal. At the Convention of 1776, the Great Seal of the Province was adopted as the Great Seal of the State until a new seal could be devised. It remained in effect until 1794, when a new seal and a new motto, Industry the Means and Plenty the Result, were approved. The 1794 seal served the state until 1817 when another new seal was adopted. The 1817 seal consisted of the coat of arms of the United States encircled by the words "Seal of the State of Maryland". 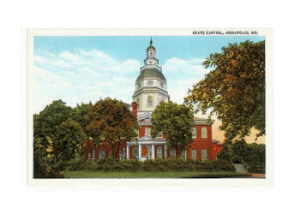 By 1874, after over 55 years of service, the official Seal of the State of Maryland was worn out and needed replacement. Governor Enoch Louis Lowe suggested that the coat of arms of the United States should be replaced with the arms of Maryland on the new seal. In response, the former Great Seal of the Province was called into service as the Great Seal of the State, replacing the 1817 seal. A new seal was ordered, but a series of errors and political tricks delayed delivery. In 1876, the Legislature issued and approved these resolves. WHEREAS, Senate Joint Resolution No: 9, "In Relation to the Great Seal of the State," passed by the General Assembly at its Session in 1874, instructing the Governor to have the Great Seal of the State so altered, that it should conform to the Arms of Lord Baltimore, as represented on the title page of Bacon's Laws of Maryland, printed in 1765, by Jonas Green, was passed, under the impression that the said representation was accurate. And whereas, Investigation has shown that said representation of the Arms of Lord Baltimore is imperfect. First. Be it Resolved by the General Assembly of Maryland, That Senate Joint Resolution No. 9, "In Relation to the Great Seal of the State," passed by the General Assembly at its Session in 1874, be, and the same is hereby, rescinded. Second. And be it further resolved, That the Governor of the State is hereby authorized and empowered to have the Great Seal of the State altered, so that it shall bear the Arms of Maryland, as represented upon the Seal furnished the Province in 1648 by Cecilius, Lord Baron of Baltimore; which Arms are described as follows, viz: Quarterly, first and fourth paly of six or and sable, a bend counter-changed; second and third quarterly argent and gules, a cross battony counter-changed: Crest, (which is placed upon a helmet showing five bars, over a count-palatine's coronet,) on a ducal coronet proper, two pennons, dexter or, the other sable; staves gules: Motto, "Patti maschii, parole femine." --Supporters, a plowman and a fisherman proper: a mantle deubled, with ermine, surrounding the arms and supporters; upon a border encircling the Seal shall be engraven this legend : "Scuto bonae voluntatis tuae coronasti nos," The diameter of the Seal shall be three inches. And so it was, that in 1876, the seal that had served as the Great Seal of the Province of Maryland over 200 years before, was once again serving as the Great Seal of the State of Maryland. The Great Seal of Maryland is unique among the seals of the states. Unlike any other seal, it is of strictly heraldic design. Heraldry is the practice of "...devising, blazoning and granting armorial insignia and of recording and tracing genealogies". The design of the seal is, in fact, the family arms of the Lords Baltimore (Calvert family). The translation of the motto has varied over the years. In 1993, State Archivist, Dr. Edward C. Papenfuse presented his translation in response to charges that the motto, as transcribed in law (see below) was discriminatory. We have offered Dr. Papenfuse's translation above, "Strong deeds, gentle words", even though the legal translation remains "...loosely translated, 'Manly deeds, womanly words'." 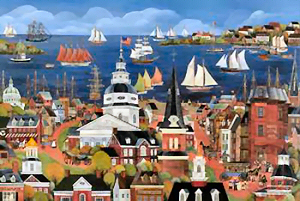 Like many states, Maryland's state motto was adopted as an element of its official seal. The following information is excerpted from the Maryland Statutes , Title 13, Subtitle 1, Section 13.102. Note the abundant use of heraldic terms in the statute. § 13-102. Description of Great Seal. (a) Obverse.- On the obverse of the Great Seal of Maryland is an equestrian figure of the Lord Proprietary, arrayed in complete armour and bearing a drawn sword in his hand. The caparisons of the horse are adorned with the family coat of arms. On the ground below is represented a sparse growth of grass on sandy soil, with a few small blue and yellow flowers. On the circle, surrounding the obverse of the seal, is the Latin inscription "Caecilius Absolutus Dominus Terrae Mariae et Avaloniae Baro de Baltemore", meaning "Cecil Absolute Lord of Maryland and Avalon Baron of Baltimore" (Avalon refers to Lord Baltimore's first settlement in the new world, in Newfoundland). (b) Reverse.- On the reverse of the Great Seal of Maryland is Lord Baltimore's hereditary coat of arms. The 1st and 4th quarters represent the arms of the Calvert family described in heraldic language as a paly of 6 pieces, or (gold) and sable (black) a bend counterchanged. The 1st and 4th quarters are the left-hand top quarter and the right-hand bottom quarter. The 2nd and 3rd quarters show the arms of the Crossland family, which Cecil inherited from his grandmother, Alicia, wife of Leonard Calvert, the father of George, 1st Lord Baltimore. This coat of arms is in quarters also, argent (silver) and gules (red) a cross bottony (boutonne, with a button or a three-leaf clover at the end of each radius of the cross) counterchanged. Above the shield is placed an Earl's coronet (indicating that though only a baron in England, Calvert was an earl or count palatine in Maryland). Above that, a helmet set full faced and over that the Calvert crest, (2 pennons, the dexter or the right one or (gold), the other sable (black) staffs gules (red) issuing from the ducal coronet). The supporters of the shield are a plowman and a fisherman with their hands on the shield, designated respectively by a spade held in the right hand of the plowman and a fish held in the left hand of the fisherman (the fish is heraldic and cannot, therefore, be identified as to any species). The plowman wears a high-crowned, broad-brimmed beaver hat; the fisherman wears a knitted cap (somewhat resembling a stocking cap). The motto in Italian on a ribbon at the feet of the plowman and fisherman is the motto of the Calvert family "Fatti maschii parole femine" loosely translated as "Manly deeds, womanly words". Behind and surrounding both shield and supporters is an ermine-lined mantle and on the circle around this part of the seal are the words "Scuto bonae voluntatis tuae coronasti nos" (5th Psalm, 12th verse: "With favor wilt thou compass us as with a shield") and the date 1632. The date refers to the year the charter was granted. Section 13-101 of Subtitle 1 states that "(b) Use.- The reverse of the State seal shall be used officially. The obverse has not been used officially." Archivist's Corner: Ed Papenfuse: Original version of an article on the Calvert family motto published in the [Baltimore] SUN on Maryland Day, 2001. Scroll down to "ARCHIVIST'S CORNER" section.